To Cite: Karakus O Z, Ulusoy O. Evolution of Laparoscopic Cholecystectomy: From Multiport to Single Port, J Minim Invasive Surg Sci. 2016 ; 5(2):e36366. doi: 10.17795/minsurgery-36366. Context: Laparoscopic approach with its several techniques has become the standard method for cholecystectomy over the past decades. As technical instruments have improved and varied, the interest in endoscopic surgery has turned towards minimal invasive single site access surgery with fewer instruments, thus resulting in minimal pain, minimal scarring and better cosmesis. Evidence Acquisition: A systematic literature searching of databases MEDLINE, EMBASE, and Google Scholar was done from 1982 and updated in December 2015. Search terms were “cholecystectomy”, “laparoscopic cholecystectomy”, “four port laparoscopic cholecystectomy”, “single-incision laparoscopic surgery”. Results: Four-port laparoscopic cholecystectomy was accepted as the “gold standard” in the treatment of patients with cholelithiasis before millennium. Thereafter, two-port laparoscopic cholecystectomy was reported as a novel, safe and rapid method of gallbladder removal in consecutive reports. Single-site laparoscopic cholecystectomy with non-conventional multi-channel port method was first introduced as an alternative to the standard multi-port laparoscopic cholecystectomy in adult patients in the last decade. Success rates of performing conventional four-port laparoscopic cholecystectomy were ranging from 93% to 100% and single site laparoscopic cholecystectomy was ranging from 84% to 100%. Conclusions: Currently, it has been widely accepted that laparoscopic cholecystectomy is the gold standard for cholecystectomy. Although single site laparoscopic cholecystectomy is becoming more popular with the recent advancements, conventional multiport laparoscopic cholecystectomy is being widely used as the primary treatment modality for the gallbladder removal. With the acceptance of cholecystectomy as the primary modality, non-surgical treatment of gallstones became outdated and is of historical interest. Extracorporeal shock-wave lithotripsy or oral dissolution therapy were attempted in adults despite minimal success rate (1-3). Lithotripsy treatment for gallstones had significant disadvantages such as high cost and 50% recurrence risk within five years (2). Although there was no difference in resolution of pain between observation and laparoscopic cholecystectomy (LC) in patients with biliary dyskinesia, those that underwent LC had a much quicker resolution of pain compared with those that were observed (4). With parallel advancements in all aspects of surgery, cholecystectomy and then LC have become the first choice of treatment modality. The first experience of cholecystectomy was performed by Carl Langebuch of Germany in 1882 (5, 6). Nearly one century later, in 1985, Eric Muhe of Germany designed a new operative laparoscope called “galloscope” and used it for the first LC (7, 8). After that, many consecutive articles relating to first experience with LC were published in 1989 in France and USA (9, 10). Laparoscopic approach with its several techniques has become the standard method for cholecystectomy over the past two decades. LC has more advantages than open cholecystectomy including decreased discomfort, reduced hospital stay, improved cosmetic result and faster return to routine and sportive activities (3, 11-15). These advantages arise from less muscle disruption and reduced tissue trauma; result in less discomfort and ileus than open surgery. Recently, patients who underwent LC without complications, were discharged on the first day or the same day as an outpatient procedure (11, 12). As the technical instruments have improved and varied, the interest in endoscopic surgery has turned towards minimal invasive single site access surgery with fewer instruments, thus resulting in minimal pain, minimal scarring and better cosmesis. We performed a systematic literature search of all full-text articles published between January 1982 and December 2015 according to the preferred reporting items for systematic reviews. This search was performed in MEDLINE, EMBASE, and Google Scholar. The systematic search was completed in December 2015. Search terms used in various combinations were: “cholecystectomy”, “laparoscopic cholecystectomy”, “four port laparoscopic cholecystectomy”, “single-incision laparoscopic surgery”. All resulting abstracts were reviewed and significant articles were obtained. References obtained within the articles, were analyzed to identify additional valuable studies. The main endpoints considered in the articles were analyzed in this systematic review. A 95% confidence interval of the operation times, conversion rates and overall complication rates was calculated. The correlation of the outcomes between conventional LC and single site laparoscopic cholecystectomy (SSLC) was assessed with Spearmen’s Rho test. Statistical analyses were performed using the SPSS software version 15. A 5% type-I error level was used to infer statistical significance. The objective of this study was comparing functional and surgical outcomes of patients treated with either conventional or laparoscopic cholecystectomy. The search was restricted only to English language publications. No geographical limits were applied. Studies were included if they fulfilled the following criteria: 1) prospective and retrospective studies with > 20 patients each group; 2) patients with benign gallbladder lesions; 3) conventional open LC, conventional LC and single-site LC were performed; 4) outcomes measures entailing operation time, conversion rate, complication and length of hospital stay. Abstract publications from conferences and experimental animal studies were excluded from analysis. A total of 1971 publications were identified through our search. A total of 1963 studies were excluded as they were non-English publications, duplicates, case reports, only abstracts and irrelevant publications. Eight retrospective and prospective studies were finally included in the review (16-23). They included a total of 672 patients, 344 (52.2%) were in the conventional LC group and 328 (48.8) were in the SSLC group. The indications for the application of the LC both single port or multi-port were commonly benign gallbladder pathology such as cholelithiasis, chronic cholecystitis and gallbladder polyps. Success rates of performing conventional four-port LC waereranging from 93% to 100% and single SSLC was ranging from 84% to 100%. Our pooled analysis demonstrated that patients undergoing SSLC required approximately 22.0 more minutes in operation (P < 0.001; 95% CI, 11.2 - 31.4). The overall postoperative complication rates were cumulatively 2.90% in conventional LC and 2.74% in SSLC (P > 0.05). There is no complication risk between patients performed conventional LC and SSLC (OR = 0.56, P = 0.71; 95% CI). There is no difference of the length of hospital stay between conventional LC and SSLC (P = 0.09). However, Chang et al. found that hospital stay was lower in the SSLC (0.76 day) than the conventional LC (1.53 day). The accumulative conversion rates were 1.74% in conventional LC and 6.09% in SSLC (P > 0.05). Outcomes of the reports were summarized in Table 1. Abbreviations: CLC, conventional four-port laparoscopic cholecystectomy; NR, Not reported; SSLC, single site laparoscopic cholecystectomy. One study from USA reported that there is no difference in total cost between conventional LC ($ 20.6 K) and SSLC ($ 29.7 K) (P = 0.08). However, another study from Singapore reported that conventional LC ($ 1.970) was cheaper than the SSLC ($ 2.547). Three most important basic instruments used during the first LC were laparoscope, hemoclip and pistol grip scissors (7). 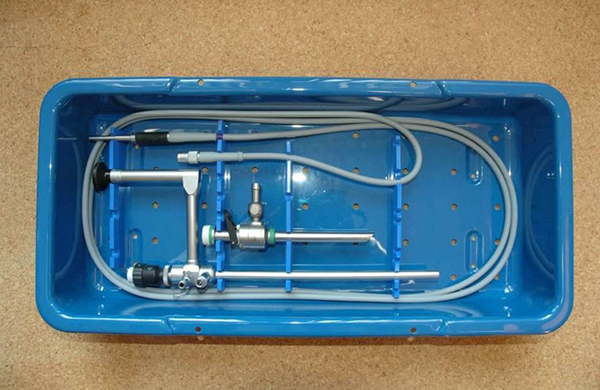 Prior to its use for LC, the laparoscope was used by gynecologists for a long time for diagnostic purposes (7). Pistol grip hemoclip appliers, scissors were designed in different sizes to ligate ducts and vessels for open cholecystectomy (24). Pistol grip appliers, scissors and hemoclips were passed through tubes into the rectosigmoid colon for polipectomy and these movements anticipated the essential techniques for LC (24). The idea of using these instruments for laparoscopic surgery can be considered as a revolution in abdominal surgery. Four-port LC was accepted as the “gold standard” in treatment of patients with cholelithiasis before millennium (3, 13, 14, 25). A 5-mm or 10-mm cannula is first introduced through an umbilical or peri-umbilical incision for the telescope. Diagnostic laparoscopy is then accomplished followed by the introduction and placement of three accessory ports (3-mm to 10-mm) from the midline to the right anterior axillary line. Succeeding manipulations are performed through these four ports with help of an assistant (3, 15). LC had 4% of conversion rates from laparoscopy to open one in initial series (3). Nevertheless, as LC has been widely performed all over the world, an overall conversion and mortality rates have been reduced to 0.6% (3, 9, 25). Some authors have also reported 0% of mortality rates (9). Reddick et al. performed a prospective study on non-acute patients comparing LC with the muscle sparing mini-cholecystectomy. They found a decrease in both postoperative hospital stay (1.96 days vs. 2.80 days) and the ability to return to work (6.5 days vs. 34 days) for those that underwent LC (9). As the endoscopic surgery evolves towards less invasive, scarless surgery, many new techniques have been developed to minimize the wound scars. In 1997, Navarra et al. reported that LC was performed by converting two skin incisions into one wound in the upper part of the umbilicus with two ports and usage of multiple transabdominal sling sutures to retract the gall bladder without complication (26). Thereafter, two-port LC was reported as a novel, safe and rapid method of gallbladder removal in consecutive reports (27, 28). In this method, two supra-umbilical and epigastric ports or transumbilical, single incision and two umbilical ports were used with the aid of traction sutures passed transabdominally. However, minimal access surgery methods did not gain acceptance before the millennium. To minimize the number of the ports, pain and scar formation, thereafter, single-site laparoscopic surgery also named as single-site access surgery (SSA), has come into practice and has started to be preferred over many laparoscopic procedures (29-33). With all of these efforts to reduce the number of ports, in 2003, Tsin et al. reported the first case of culdo-laparoscopic cholecystectomy (34). In 2007 and thereafter, several authors reported experience of the first LC performed either transvaginal or transgastric route also called natural orifice transluminal endoscopic surgery (NOTES) (35-37). Although many reports have been published in the literature in last decade, NOTES has several ongoing challenges (6, 37, 38). Some of the principal problems are: limited ability to establish spatial orientation, unregulated insufflations pressure within the peritoneal cavity, bacterial contamination, rectal wall injury, urinary bladder perforation and pelvic abscess formation (37, 39, 40). Nonetheless, the inherent difficulties and lack of the optimal technical instruments of NOTES has restricted the wide use of cholecystectomy (6, 38). The practice of NOTES in children is almost absent. As much of the instrumentation and skills developed laparoscopic surgery has evolved SSA surgery rather than NOTES. SSA surgery performed for cholecystectomy has rapidly increased in recent years and replaced multiport LC as the surgeons gained experience in laparoscopic surgery. SSLC with non-conventional multi-channel port method was first introduced as an alternative to the standard multi-port laparoscopic cholecystectomy in adult patients in the last decade (41, 42). In the SSLC, usually a non-conventional single use three-channel port system of 20 - 30 mm diameter (SILS-port (Covidien), Tri-Port (Olympus) and reusable port X-Cone (Karl Storz)) and articulated working instruments are used. Although SSLC with a non-conventional single use three-channel port system is gaining popularity amongst adult patients, there are limited reports relating to pediatric patients (33, 43-47). The disadvantage of the non-conventional single use three-channel port systems is the extra cost of ~ 300 - 350 € (48). Another disadvantage of SSLC for pediatric patients is ~ 20 - 30 mm umbilical incision. This incision is relatively large in comparison to the size of average pediatric patient. Nevertheless, several authors suggest that single site surgery has superior cosmetic results with the single incision approach (48, 49). On the other hand, the procedure may lead to complications such as the clashing of the instruments in children due to limited and restricted space as well as the loss of triangulation. However, this disadvantage may not be valid in adult patients. SSA laparoscopic surgery performed with non-conventional ports and single incision transumbilical multiple ports has an increased potential of developing a hernia (47, 50, 51). The wide fascial incision done to place the non-conventional ports pose a risk for development of fascial defects. Cost-effective alternative techniques have been developed over time due to the aforementioned disadvantages of non-conventional single use three-channel port systems. For this reason, transumbilical multiport access where ports are introduced into the abdomen from a single umbilical skin incision but with separate facial incisions has been reported for SSLC. The operation is then conducted with conventional or non-conventional instruments (43, 50, 52-55). However, closely placed multiple fascial incisions and fitting multiple instruments within a narrow area may affect the blood supply, may cause necrosis and may lead to port site hernias in the single incision transumbilical multiple port procedures (47, 51, 54). Although both non-conventional and conventional ports s have been used, the limiting features of SSLC are its high cost and longer operation times despite better cosmetic results. It is possible to perform SSA using conventional working instruments, through a conventional 11 mm umbilical port (56-58). Since 2005, Ates et al. is performing single port laparoscopic appendectomy with conventional port and instruments (56, 57). In 2009, Bucher et al. have reported that the use of single conventional port and conventional laparoscopic instruments for SSLC was limited to adults (59). They used only conventional instruments including a 12 mm umbilical port, a 10 mm operating scope with a 6 mm working channel, a dissector, a hook cautery, endoscopic clips and 2 transabdominal sling sutures to perform cholecystectomy in this series. Reports of SSLC in children have stated the use of conventional port, operating scope and instruments (Figures 1 and 2) (60). The risk of hernia in the SSLC with a conventional single 11 mm umbilical port and an operating scope, is less than in SSLC with non-conventional single use three-channel port systems (60). The operating scope allows easier control of the camera movements and provides control of camera movements by the operating surgeon (zoom in and out and helps keep the target in the middle of the view) (60). These advantages allow the operating surgeon to control all of the camera movements by him/herself without the assistance of another person thus making this technique a single-surgeon laparoscopy through a single conventional port. 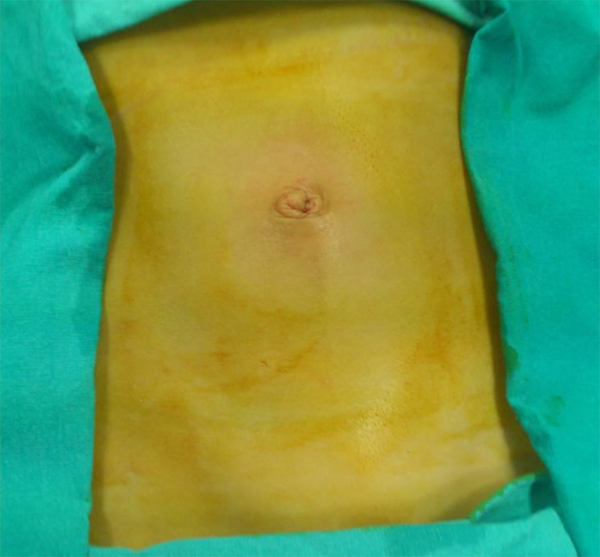 During SSLC with a single port and an operating scope, the scar does not exceed the umbilical margins when the umbilical incision is done inside the umbilicus (Figure 3). For this reason, the postoperative pain is minimal and easily controlled. However, one disadvantage of the operating scope is that the surgeon has to operate in one axis without the advantage of “triangulation” of the instruments (58, 60). This is also a disadvantage of the non-conventional single use three-channel port systems. For the surgeons who do not have experience with an operating scope, the management of the scope and the working instrument might be complicated at the beginning as the camera moves parallel with the working instrument. Although this inconvenience is being solved with practice, highly skilled and experienced surgeons are necessarily needed. However, training methodologies developed for teaching LC to adult surgeons are not convenient to teach advanced skills required for pediatric endoscopic surgery. The learning curve for pediatric laparoscopic surgical procedures is quite long (61). When considering the operating time, LC with SILS-port has been compared with a standard 4-port laparoscopic cholecystectomy in a prospective randomized trial. The authors emphasized that the operating times and the degree of difficulty for LC with SILS-port were significantly greater than 4-port cholecystectomy (49). Similarly, average operative time in the SSLC with conventional port and operating scope was longer than standard multiport laparoscopic cholecystectomy (60). But the authors suggest that dissection of the Calot’s triangle in overweight patients with gallbladder inflammations is more difficult compared with multiport cholecystectomy (60). Standard multiport laparoscopic cholecystectomy, therefore, may be preferred in overweight patients according to experience and skills of the surgeon. SSLC with single port and operating scope seems to be a safe, cheap and highly minimal invasive procedure with excellent cosmetic results. Note that umbilical incision does not exceed the umbilical margins. Currently, it has been widely accepted that LC is the gold standard for cholecystectomy. Historically, the surgeon who could perform an operation in the fastest way and without causing too much pain to the patient, was considered the best surgeon. Furthermore, it was thought that large operative wounds were required for adequate surgical exposure. However, large wounds are responsible for more postoperative pain and morbidity such as infection or dehiscence. 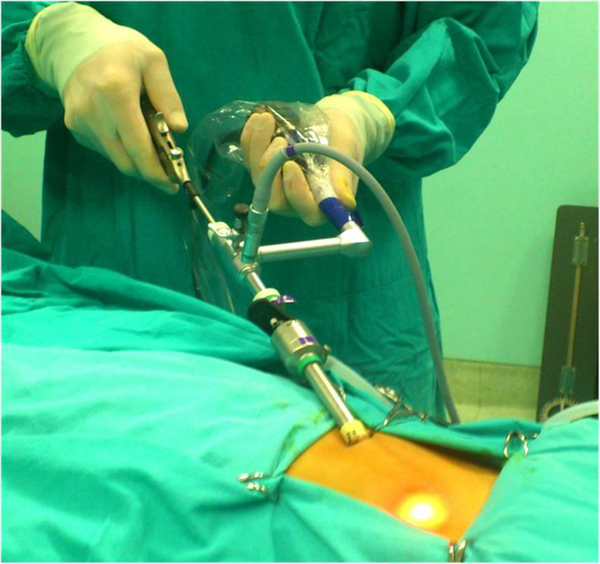 For this reason, surgeons who want to avoid postoperative pain and morbidities are inclined to move from multiport laparoscopy to single port laparoscopy. Although SSLC is becoming more popular with the recent advancements, conventional multiport LC is being widely used as the primary treatment modality for the gallbladder removal. Authors’ Contribution: Osman Z. Karakus designed research; Oktay Ulusoy and Osman Z. Karakus performed research; Osman Z. Karakus and Oktay Ulusoy wrote the draft of the manuscript; Osman Z. Karakus made critical corrections and revision.